Adam reviews Joe Wright’s newest film Darkest Hour. The WWII Biopic stars Gary Oldman, Ben Mendelsohn, Kristen Scott-Thomas, Lily James and Stephen Dillane. There are a great many things to admire about Darkest Hour, Joe Wright’s seventh feature film. Wright (Atonement, Pride & Prejudice) dwells in that dwindling market of mid-level serious drama made with the precision and talent that usually occupies empty tent pole endeavors. The film is a beautifully-crafted historical docudrama that never feels stilted or boring. The director, as is his trademark, finds an entry point for modern audiences worried that they are in store for yet another stagnant drama about things that leave modern audiences unconcerned. Though Darkest Hour is all these things, at its core it is a showcase for Gary Oldman and his transcendent performance as Winston Churchill. Rather than make a “cradle to the grave” biopic, Wright and screenwriter Anthony McCarten have crafted a political potboiler taking place in May 1940. Those who have seen Christopher Nolan’s Dunkirk will already know how this time frame played out on the battle field. Darkest Hour uses Dunkirk/Operation Dynamo as a framing device to set its ticking clock and plot into motion. The film focuses on Churchill’s appointment as the new Prime Minister and the forces that colluded to push him out of office. Those expecting a stodgy “corridors of power” film will be pleasantly surprised that Darkest Hour takes the sub-genre and creates something of a thriller more akin to All the President’s Men or Apollo 13 rather than what is the norm. That is to say that Darkest Hour manages to wring tension out of a historical situation where everyone knows the ending. This is no small feat and is directly attributed to not only Wright and McCarten, but also the work of editor Valerio Bonelli and composer Dario Marianelli. Both Bonelli’s taut editing and Marianelli’s subdued, but propulsive, score keep the story moving forward even during the more pensive scenes. 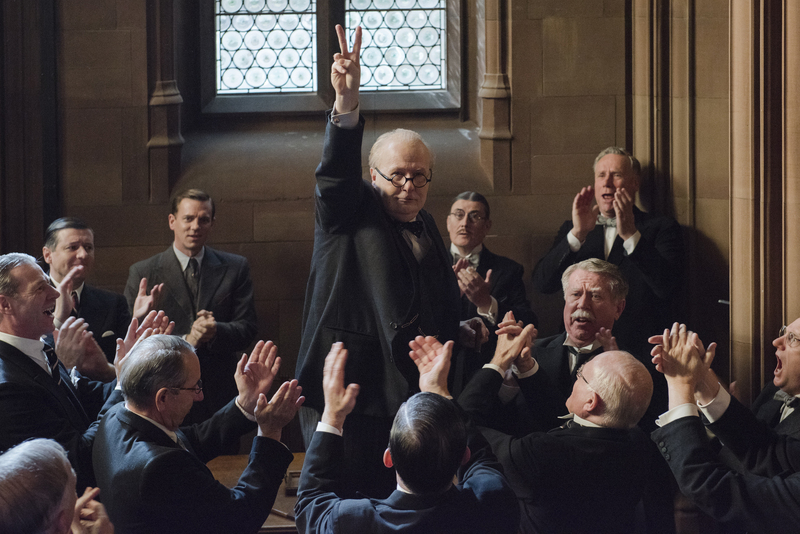 At the center of the brewing storm that is Darkest Hour is Gary Oldman’s performance as Sir Winston Leonard Spencer Churchill. Oldman’s performance is one built from a career of amazing film, television and theater work. His Churchill is not just a transformative performance but one that critics will be hyperbolic about, but with good reason. From the opening reveal of Churchill in bed, the performance is no longer a performance but a living being. There are no seams in the Oldman’s performance. An audience will be transfixed by this truly impressive feat. Oldman underwent hours of prosthetics and seems to have been inspired by playing Churchill. The actor changes everything from his speech, gait and even posture for the performance. Never once are these gimmicks, rather they help an audience. Oldman’s Churchill is so magnetic he becomes the audience entry point into this point in history. The work done by the actor is so inviting and accomplished he makes everyone around him better. The supporting work done by the cast cannot be undersold. Kristen Scott-Thomas and Ben Mendelsohn both do exemplary work as Clementine Churchill and King George. Scott-Thomas as Clementine brings a sadness and warmth to a role that could have been another “I have sacrificed so much…” stereotype. The actress avoids any pitfalls and clichés in bringing out the kind guidance of Clementine in the more reflective scenes with Winston. Mendelsohn continues his brilliant character work turning in a mannered, cool and fun performance as King George. George is both scared of, and intrigued by, Churchill. The scenes between Mendelsohn and Oldman as the King and Prime Minister are some of the highlights of the film as the two actors attempt to out British one another (hint: Oldman wins). The only criticism lands on the use of Lily James as Elizabeth Layton. Though the actress is fine as the young woman who would become Churchill’s personal secretary, it is a role that is severely underwritten. Layton was a fascinating figure in history and just isn’t given the on-screen moments to prove it. If one does not know Layton’s own story, one would think that the writer had created her just for this movie. In a film that treats other key historical figures like Neville Chamberlain (Ronald Pickup) and Lord Halifax (Stephen Dillane) with respect, it’s an odd slight in an otherwise thoughtfully-considered representation of an important moment in British and World history. Darkest Hour delivers not only a truly brilliant performance but a film that eschews the normal trappings of this particular type of awards fodder. In fact Darkest Hour goes beyond awards bait and stands as a commentary and reflection of our dangerous times where many think they speak for the people. Darkest Hour’s title does not indicate that the film proposes that those people in power often times do not have the pulse of the people. In an era of uncertainty, this sentiment rings truer than in years past. If only we had another Winston Churchill. If only…. Darkest Hour opens November 22nd in New York and Los Angeles expanding nationally in the coming weeks.